On Saturday the Militant rode into Chinatown for the long-awaited Chinatown Summer Nights (not to be confused with Mayor Villaraigosa's Summer Night Lights program, the annoying karaoke anthem "Summer Nights" from Grease, or Richard Marx's "Endless Summer Nights"). It's a weekly nocturnal event put on by the CRA, Community Arts Resources, KCRW and various cultural and business organizations based in Chinatown to promote nightlife in the Chinatown Plaza vicinity between 5 p.m. and midnight. It seemed like a decently-attended event, although by the time the Militant arrived a little after 10 p.m., some aspects were already shutting down. All of the energy seemed to be at either the existing bars. the outdoor dancefloors pumping music from various KCRW DJs, or the line of food trucks queued at the Lei Min Way alley. The areas in between, thought, were largely empty. Most absent, and the biggest bummer for the Militant was the no-show of the promised Night Market feature of the event, as he previously reported in This Here Blog. The Militant got to the bottom of this, and found out that due to budget reasons (remember, kids, anything that doesn't happen in life can easily be blamed on a budget issue), the Night Market (also described as a "Craft Fair") will only be running for two out of the four Saturday of Chinatown Summer Nights: On the 14th and on the 28th. And unlike the original plan, which called for vendors located all over Chinatown Plaza, Chung King Road and the Bamboo Lane Alley, the Night Market will only occupy the parking lot space off of College Street between Hill and Broadway. Yes, as expected, CSN was populated by Hipsters and HipKids (read: multi-ethnic 20-something locals who are into the same things as hipsters are but do not live the hipster lifestyle), and the Militant won't waste your time bitching about that as usual, but it would be nice to see more families and over-40 folks in the mix, as CSN seems to be targeted to a general audience. After all, the whole point of this event was to promote Chinatown's nightlife to folks who normally don't drop by these here parts when it's not time for the Golden Dragon Parade. And people already go to The Mountain Bar or the nearby art galleries. The other big gripe was the seeming lack of anything Chinese or Chinese American going on in the added nightlife activities, at least by the time he got there. The Militant heard there were some performances and cultural- and food- demonstrations earlier in the evening, but dude, this is Chinatown. Represent! This past Saturday's attendance, though, might have been heavily influenced by spillover crowds from the HARD Summer Music Festival going on at the Los Angeles State Historic Park next door. Which means this weekend's crowd could be anybody's guess. One cool thing was the free bike valet provided by the Los Angeles County Bicycle Coalition. They will be there all four weeks of CSN and they're located towards the Hill Street side. Do take advantage of it when riding down there. The Militant may or may not have! So drop by this Saturday. You may or may not see the Militant! Commandeered by Militant Angeleno @ 1:59 AM No comments: Hyperlinks, yo! It's summertime, and the Militant set out on Monday to do his ritual, which he tries to do at least once every Summer - ride his bike from the Militant Compound (located in an unspecified location in Central Los Angeles) to the beach (Here's a post from 2008, via a different route, on this ride)! The sun was shining, so he brought his bike out onto the streets of Los Angeles, and headed westward! Okay, after rolling down on an unspecified boulevard and turning on an unspecified avenue, the Militant found himself going south on Oxford Street, just a block east of Western Avenue and a far better alternative as far as riding on two wheels goes. There he headed west on 4th Street, in all its sharrowed-ness, transitioning from the dense apartmentage of Koreatown to the tony mansions of Hancock Park, all while staying on the same street. Upon reaching La Brea Blvd, it's back to the vehicular combat heading south, but not for long; for upon reaching another bike-friendly thoroughfare - Redondo Blvd - just south of Olympic, it was easy sailing for the next few miles. At the end of the road was Jefferson, where the Metro Exposition Light Rail Line was being built in front of him. In this section, just west of the future La Brea Station, rail was being placed down. Just west of the future La Cienega Station was a peculiar sight: As most of us know, the Expo Line is the modern-day replacement of the Pacific Electric's Santa Monica Air Line and the wooden bridge which carried the old Red Cars was not torn down for the Metro Rail structure, but rather, the new rail structure was built directly over it (pictured left)! Perhaps the adjoining Exposition Bikeway will be using it when the light rail opens next year. The Militant veered west on Washington, just past the future Expo Line terminus, rounded the corner near the Downtown Culver City Trader Joe's and found himself on Culver Blvd, where he continued in a westerly direction, eventually finding the rails-to-trails Culver Boulevard Median Bicycle Path (pictured left) - which was once a Pacific Electric Red Car Line, and later a Southern Pacific freight line until 1976, The county's transportation commission (Metro's predecessor) bought it in 1990 and converted it to the bike path we see today. ...The marine layer. Greeeeat. Suddenly his bright blue Summer sky yielded a dreary mass of grey, more suited for Winter or early Spring days. Um, wasn't the point of this ride to celebrate Summer? But the Militant's ever-observant eye did spot a peculiar monument on Culver Blvd and Mascagni Street in the Del Rey neighborhood of Los Angeles - an over-six-foot tall entrance pylon (pictured right), most likely a vestigal remnant of the neighborhood's old subdivision development (Note to self: Find some more like this around town. Could make a great future MA post...). Now with his shades off (hope no one was following him at that point), the Militant ended up on some side streets and made his way to Lincoln Blvd north and Washington Blvd. west, where a fellow cyclist rode alongside him. He was riding a fixie, but he was no teenager or hipster. He was some dude in his '50s. He looked like he was in pain. Poor dude (BTW, there's some sewer replacement going on around here, so be mindful if you're gonna ride along Washington north of the Marina). In no time, the Militant found his way onto the Venice Pier. But it was overcast. And cold. There Militant was not a very happy camper, especially since he came dressed for temperatures a little higher up on the thermometer. Funny thing, each of the lifeguard stations along the beach was painted in a bright tone, and bore the words, "Summer of Color" (pictured left). Ummm, riiiiight. He can find two things wrong with that statement on this dreary un-summery day. So the Militant just rode north on the beach bike path, passing by the Venice Beach Boardwalk, with its numerous souvenir shops, street performers, marijuana dispensaries and throngs of unhappy tourists, expecting to see and experience something that resembles Summer. The Militant biked north until the Santa Monica Pier, where he walked his bike up onto Ocean Avenue and east on Santa Monica Blvd. As he passed the Third Street Promenade, he noticed that the place looked exactly the same as the last time he was there (some three or so years ago...). He continued down the boulevard, and after Lincoln, decided to use the less-busy Broadway instead. A perfect route, as it had not only a bike lane but a number of traffic-calming devices, such as curb bump-outs, built into the street! At this point night was falling, and he learned Broadway in Santa Monica turned into Ohio Ave. in West Los Angeles. He had no choice but to continue on Santa Monica Blvd, but then picked up the SMB bike lane after Sepulveda. 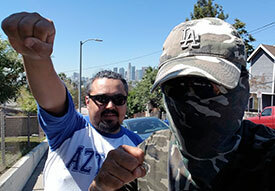 It was at this point the Militant was debating whether to just rest and hop on the Metro 4 or 704 bus back to Central Los Angeles or just continue on the bike. A pounding headache made the latter difficult, but a true Militant never takes the easy way out! ARRRRGH! While passing through Century City (and taking a short Twitter break), he saw some guitar-playing d-bag on Santa Monica try to serenade some chicks waiting on the curb in front of the Westfield Century City on the other side of the street. LOL. Anyway, it wasn't long before the Militant found himself in Beverly Hills and Little Santa Monica Blvd turned into Burton Way (yet another abandoned Red Car route!). Then after being near the Beverly Center area and just down 3rd Street from Farmer's Market, he realized that he might as well finish the journey on bike, as he was almost there. From 3rd down Cochran it was back on 4th Street, and then back on Oxford, and then onto the various unspecified streets that led him back to his compound. The Militant was so worn out from this nearly 40-mile trek that he lacked the energy to post this blog entry until a day later (must be getting old...)! Anyhoo, comparing this post to the route he took back in '08 shows that both knowing more bike-friendly routes and the existence of more official bike infrastructure can really make a difference riding through Los Angeles. Broadway through Santa Monica was an awesome route, and the Militant hopes the bike path that adjoins the Metro Exposition Line would make this trip a lot easier come next year. He would also like to see true bike-friendly improvements along Santa Monica Blvd west of Sepulveda, and link that to Ohio Avenue and Broadway in Santa Monica. Commandeered by Militant Angeleno @ 11:06 PM 4 comments: Hyperlinks, yo!